Happy Thursday...Friday is almost here!! Do you have all your Christmas shopping done? I have to say I am almost finished. Just need to find a few more items for the stockings. 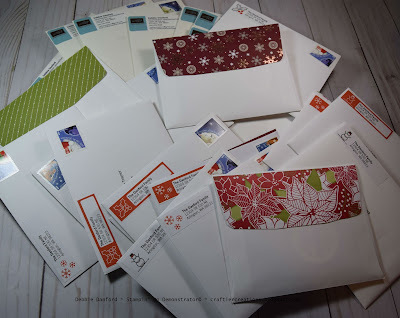 Today all my Christmas cards are going out in the mail. I had planned on getting them out on Monday, but that didn't work. Because my down line has seen most of my cards, I made them something a little different. Hopefully they don't read this first. 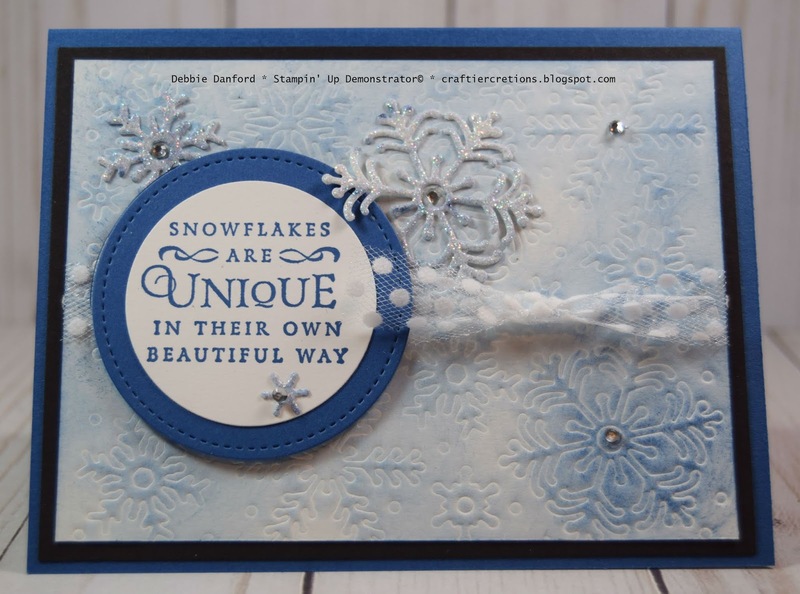 I had several snowflakes that had been cut from the Blizzard Thinlits Die, so I based my colors on what I had, so I could use them up. I made three different color combos out of the same card design. 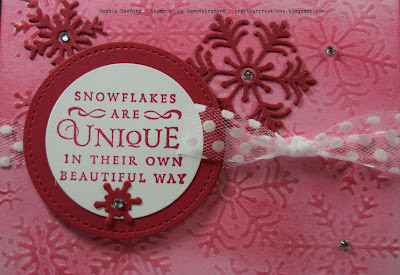 I used the embossing mat and the Blizzard Thinlits Die to emboss the background on a piece of Shimmery White paper. 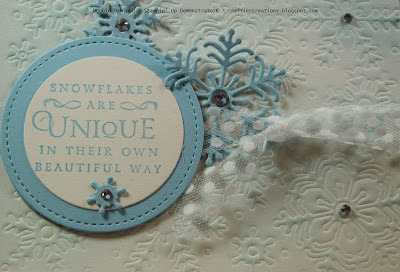 Now if you have this embossing and are not sure how to use it. I will post a video below that will show you exactly what to do. Also...if you look at the back of the paper work that comes with the embossing mat, it gives you all the combinations for cutting. Sponge the background with the appropriate color. Add a piece of White Polka Dot Tulle Ribbon and attach to all layers. 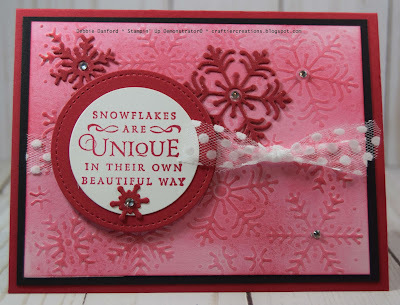 Stamp phrase in appropriate color and die cut with Layering Circles. 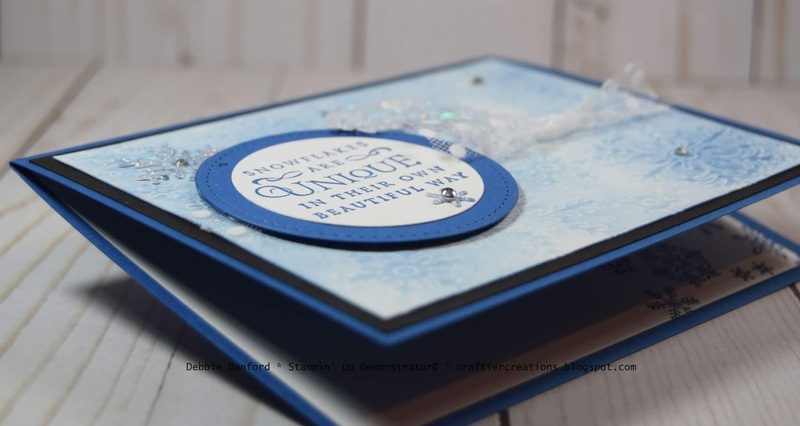 Die cut layer with the Stitched Framelits Circle. 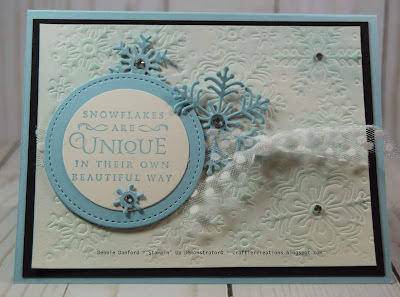 Some the snowflakes were cut from Glimmer Paper, and some were cut from card stock. The ones from card stock I added Wink of Stella on top. 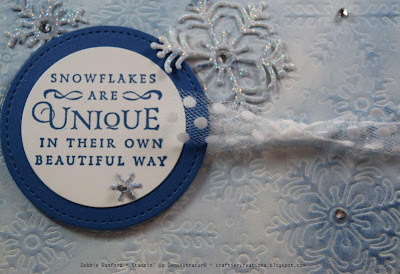 Add a few Rhinestones and walah! You are finished.